I love personalised stuff. Stickers, greeting cards, bag tags, magnets, cake toppers…You name it. Receiving something personalised to me, is like receiving a photo album filled with lovely photos of my family who mean a great deal to me, instead of a blank photo album which would make me feel like I am just one of the many people whom someone is buying a random gift for. This year we even personalised something we have never done before – a Christmas tree! Last weekend, we had an enjoyable time at a Christmas get together with the wonderful people from Canon. We had great food and a whole load of fun decorating our own tree. See how much fun we had? Im not totally sure if Isaac was happy because he got to decorate the tree or because he finally managed to get his hands onto a pair of scissors (under supervision of cause). Apart from Isaac’s photograph as the tree topper, did you notice the cute little Santa sitting on the tree? Both the photo(s) and the Santa cut-out were printed by the Canon Pixma printers. If you are like me, someone who is afraid to lose your photos despite multiple back ups, the safest bet would be to get them printed. The PIXMA is super easy to use and the quality of the images are good. What I really like about the printer is the convenience being able to print directly from my mobile phone through wi-fi. Oh yes, the Canon’s new Pixma TS9170 even allows you to add filters to your photos! Apart from the good printing quality in our photos above, I bet you will never guess just how interesting they are. The new Canon application, Message in Print allows us to input secret messages like animations or text into the photo prints. So how do we “decode” these secret messages? All you have to do, is download the Canon Message in Print application on your mobile phone and hold your iPhone over the photo. How cool is that?! Apart from the printers, we were also introduced to some newly released cameras. One of them was the EOS M100. For a camera that has interchangeable lens, the EOS M100 has got to be one of the most compact cameras I have ever seen. It is pretty easy to use as compared to the EOS M6 which I have tested some time back. It has a single adjustment dial which makes it easy to use if you are new to photography. For amateurs like myself, the less controls or adjustments we have to make, the better it is. Last but not least, you have got to see my favourite product… the Rayo S1! Can you make out what it is? If your guess is that it is a power bank, you are right. If you think it is a speaker, you are also correct. Best part of it all is… it is also a mini projector! It is pocket-sized and has 3 functions I would most likely use, what is there not to love about this one? Canon never fails to impress us with their new products & they keep getting better. We can’t wait to see what they have in store for us the next time. Until then, have a great Christmas everybody! Just the other day, we tried organising his room and this was how it turned out after we put the smaller items into the buckets / baskets. It seriously crossed my mind to declutter by giving away toys that he hardly plays anymore but I think the more important thing to do is to stop buying impulsively. But how else can we try new toys without having to deal with the clutter at home if isaac doesn’t like it as much as we thought he would? It was only recently that I came to know about playFULL. It is extremely convenient since all I have to do is go on to their website, pick the toys I would like Isaac to try and it will be delivered (say yay to free delivery both ways!) to my doorstep in a few days. When am done with the toys, simply let playFULL know when to pick it up. It is as simple as that! Apart from the hassle free service, I would like to share about the toys that we received in our playFULL box because we truly had an enjoyable time with these toys. This was Isaac’s face when he realised he had his very own happy mail for the first time! It is evident that he could not wait to see what awaited him in there. While taking each item out, Isaac would say “happy birthday!” or “I’m happy!” which I could obviously tell even if he didn’t mention it. So what’s in the box? The surprise toy found in the file is for keeps. Oh wait, I cannot believe I forgot to mention another reason why I like playFULL – each toy actually goes through a 4-step cleaning and sanitisation process because they know just how important our child’s health is to us. See how they are delivered in air tight packaging? The toys I selected came with an information sheet each which provides parents with playtime learning ideas that may help to develop important developmental skills. It’s all about the toys toys toys! This was the first toy that Isaac eyed the moment we took it out from the box. With such colourful parts, it is kinda hard to resist them. I told Isaac that we had to “dress” the robot up in different styles and the robot would start moving once we turn it on. I usually let him do whatever he wants at the first attempt because I like to see how he figures out what to do. When he is done with exploring the new toy, he invited me to play with him. We started off by having me tell him what colour I wanted to be on the robot’s head but he gets to decide what shapes to use. Then, I told him what colour and shape I would like to have on the different parts of the robot. Securing the pieces on the body of the robot is relatively simple because the pieces are all magnetised. It was a fun activity with Isaac because besides his basic knowledge of shapes like squares, triangles, rectangles, he learnt some new shapes like semi-circle and the trapezium. It also encouraged him to listen to instructions in order to piece the “clothings” together. When we finally turned on the walking robot, the boy was all smiles! This toy totally encouraged Isaac to count! We emptied the tubes and balls into separate boxes first just so the balls don’t go missing. It was also easier to see the colours of the balls this way. As Isaac is not able to identify the numbers yet (except the numbers 1 & 3, which are his favourites) I decided to tell him to sort out the tubes in order according to their heights. Then I let him fill up the tubes with the little balls and told him to count as he put them in. He’d count – “1,2,3” but when I ask him how many balls he put in there, he’d tell me a random number with pride *facepalm*. At the end of the activity, I realised that he had organised the balls of the same colours in each tube except for the last tube (tube5) that accommodated the remaining balls. This activity kept him occupied for almost an hour as he kept emptying the tubes and filling them up again counting along each time. These little pieces of rubber with suction allows Isaac to explore his creativity and imagination. He put the pieces together on the table top and told me what he was making – gun, door, ice cream were some of his creations even though I really could not tell what they were if he didn’t say so. We will be returning these toys soon and my only concern would be Isaac asking me for them cos he’d ask me for the robot and counting tubes from time to time. I guess this goes to show how much he really enjoyed these toys. Thank you playFULL for bringing us such wonderful toys! If you would like to get your hands on these or more selections of award winning toys from playFULL, quote ‘isaacapproves’ for a 10% discount. Promo code is valid till 31st Dec 2017. Check out their toys and subscription details here. Happy browsing! 21 September 2017 is the day we have been anticipating since a couple of months back. We are taking our first flight out of SG with Isaac (now 2 and a half years old)! As he has never been on a plane, we decided to pick a nearby destination this time just in case he has issues being on the aircraft. So Bangkok it is! To make it even more fun, we are going with our close friends and their 2 daughters who are around Isaac’s age. With our flight at 7.20am, I was up by 3am to get ready and to go through one last round of check to make sure we had everything we needed before leaving home. With Isaac this time we definitely have a lot more to pack. Trying to get Isaac out of bed at 4.30am was a struggle even though we told him we would carry him and he can continue to sleep. After trying to pacify our boy to get into the baby carrier, we finally made it out of the house by to wait for the arrival of our maxi cab. I love the idea of travelling in the maxi cab especially when there are 7 of us. Arrived at the airport at 5.15am and checked in before having breakfast. By this time, Isaac is already wide awake and wanted to run around at the airport with his friend, K. I was initially worried that Isaac would not be able to sit still through the ride but it turned out pretty alright. He slept 3/4 of his time in the plane, so lucky for us, we managed to take a short nap too. Arrived at our hotel and was allowed to check in earlier than expected. The room was nice and clean as the hotel is rather new. Immediately showered Isaac after he was done pretending to go to bed and waking up multiple times and then got ready to head out again. Plan was to visit where we wanted to go based on location just so we don’t waste time travelling to and fro for the next 5 days. Today’s hangout place is gonna be near the hotel cos we were all tired from waking up at 3am. Travelled to Siam because is it only a few stops from hotel by BTS. We chose to travel around by the BTS because the traffic is usually quite crazy here most of the time. During our ride to the hotel from the airport, the cab driver told us that the non peak timing is probably from 9-10pm (TH time). Every other timing in the day is just peak hour (LOL!). Traffic is usually lighter on weekends. However, if you would like to take the cab, I would recommend getting the cabs using the Grab application to avoid being overcharged by drivers who wait by the roadside to target tourists. At Siam Paragon, some of the tourist attractions you will find are Madame Tussauds and Sea Life Ocean World. We did not enter both venues because we have been there before. If you are travelling with kids under 3 years of age, you will be pleased to know that they can enter the attractions for free! We took our time to walk around at Siam Paragon and had ice cream at Ben & Jerry’s while the children had fun pretending to drive the Ben & Jerry’s vehicle in the shop. Over at Siam Square, you will also find the Line Village Store. In the evening, we headed over to this seafood place called Je Liab Seafood which is walking distance from Sanam Pao BTS station, since it is only a few stations from Siam. The food was very fresh and tasty. We knew of this place through recommendations by word of mouth. The staff were extremely friendly too. Actually most people in Thailand are especially nice when they see that we have kids with us. Unfortunately, no photos of the food were taken as we were all starving by the time we arrived. Headed back to the hotel straight after dinner so we can rest early to prepare for day 2. Woke up at 8am and had the toasted sandwich from 7-11. If you haven’t already heard, the instant sandwiches from 7-11 here is a must try. It is seriously delicious and I personally find it addictive. We chilled out till about 12pm before heading out to shop. When we didn’t have kids a couple of years ago, I remember how we used to try and fully utilise our holidays by waking up super early so we can start the shopping earlier. However now that we are here with our son, him having enough rest is our priority. We took the BTS to chidlom station and walked to platinum mall. 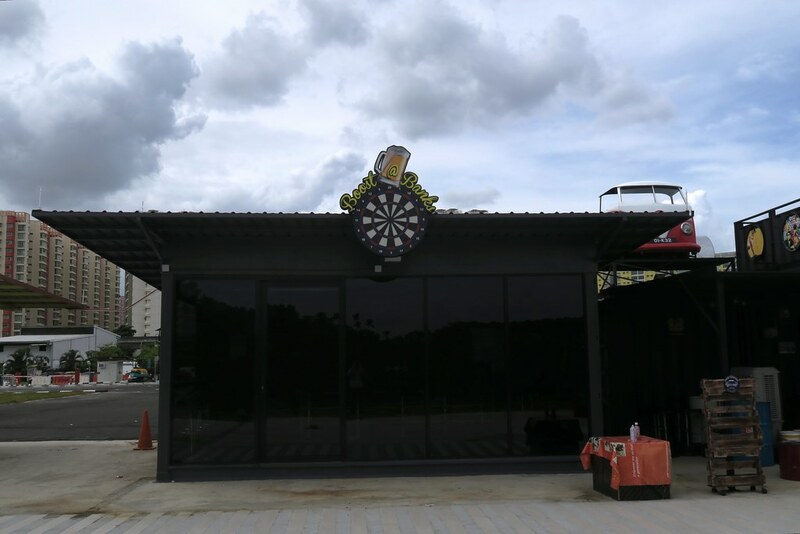 The good thing about BKK now, is that there is a sheltered connector that leads us from the BTS station all the way to the mall. Don’t have to worry if it is raining or extremely hot anymore. By the time we were done at platinum mall, I started to feel as though my shoulders were breaking. Lugging my 13kg boy around in the carrier for a couple of hours with non stop walking is seriously no joke. Simply because we are in a foreign land, we did not feel comfortable letting him run about freely. Apart from the time when we are in non crowded mall or having our meals, he is on the baby carrier the rest of the time. We took a tuk tuk to the night market because we thought the kids would like to experience the tuk tuk ride. True enough, they were squealing and shouting in joy when the tuk tuk started moving. Isaac was evidently more excited about the tuk tuk than the plane ride. The Neon Talad night market is quite a small place and the stalls sell mainly the same things. We had our seafood dinner there and the food was not bad too. While the adults had tom yum soup / spicy dishes for dinner, the kids had seafood soup, omelette and rice. Good thing is, Isaac had no issues with the food in Thailand. Took another tuk tuk back to the hotel after the night market. It was absolutely hilarious because the adults were arguing about not being able to fit into 1 tuk tuk yet my mister insisted it could be done. In the end, we really managed to squeeze 4 adults, 2 toddlers and 1 baby and our loots for the day in 1 tuk tuk! Again, the kids went crazy in excitement. One of the tuk tuk driver was amused by Isaac’s excitement that he even told us to take a photo of Isaac on the driver’s seat after we alighted. Morning started at 10am for us. Got out of the hotel and had brunch close to 12pm at a nearby restaurant that serves American breakfast. We managed to have a bowl of duck noodles before it started to rain heavily. Although we had intentions to visit Union Mall which is near to chatuchak, we decided to adjourn to somewhere nearer to the hotel. Went back to Siam Square again before going back. Brunch at theCOMMONS today. 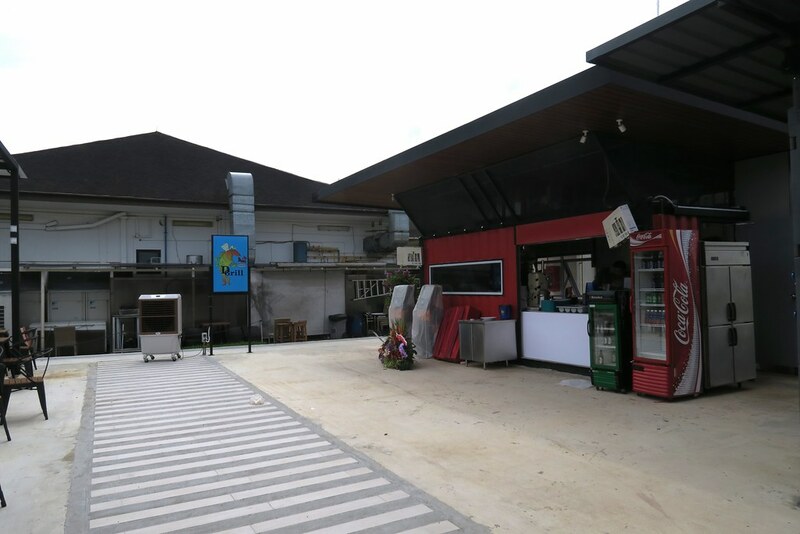 I absolutely love this place for the layout of this place, the pet/children friendly concept and the good food that we enjoyed so much. We had our brunch at this place called Roast. I took photos of most of the food we had at this place because it is too good that I just have to share. steak and fries, and i forgot to remove the knife. The food was not cheap but it was worth every cent! If we were to vist BKK again, this place is somewhere I’d definitely return to. There was also an open space and a small play area for kids on a lower level. We let the kids play for a while as I tried to Grab for a ride to Terminal 21. Terminal 21 : Another interesting shopping mall in BKK. Every storey in this mall is like a different country. I did not manage to take photos of this place as my camera was not with me. Rod Fai Night Market : This night market is quite out of the way. I am not sure which BTS station it is near to so we just took a Grab car. The journey there was almost 40mins and the kids had some time to nap or drink milk in the car especially with the nice cold (drizzling) weather it was nice to snooze. Luckily for us, when we arrived, the rain had stopped. We had light dinner at one of the stalls and then started to shop. Just 5 mins into shopping, we had already spent close to 50 dollars on tee shirts and singlets for Isaac. They designs were just so nice that we could not resist. One of my favourite shops here for kids has got to be Six Bunnies. I remember buying so many onesies for Isaac when he was a few months old from this shop and I still really like their designs. By the time we were done with shopping, it was almost 12am (sg time). Isaac was already fast asleep in my baby carrier and we went to have supper. Got back to the hotel nearly 1.30am (sg time). We are so going to sleep in the next day. This is the most slack day on this trip. Isaac got up early, the mister got up late. By the time the mister was done with his shower and ready to head out, Isaac had fallen asleep (his usual nap time is circa 1pm on most days). We decided to go out after her has woken up. Ended up leaving the room at almost 4pm. We met our friends at Central World and went to toys r us and the bookstore. We also tried After You Cafe for the first time after hearing everyone tell us how good their dessert was… and I have to agree with them. Walked to Pratunam night market to have a look although we did not have much to buy. We took our last tuk tuk ride back to the hotel. Day 6 – We are going home! Checked out just in time to get to the airport. Someone is feeling sad that we are packing up and going back. Just like how he slept through the place ride to BKK, he also slept through the plane ride back to SG. When we landed in SG, he was all excited to be home. He kept shouting “???!??? !” when we arrived at the airport. Personal thoughts about this trip : I cannot be happier that Isaac was not a difficult kid on the plane. He enjoyed himself as much as we did. I think he is just happy to be able to hang out with friends around over the past few days. Apart from having to carrying a huge bag / Isaac in the carrier the whole day, this is by far the most relaxing trip I have been on. There was no rush, we slept until we had enough rest. We did not even follow any itinerary as we played by ear knowing it would be hard to stick to the plans since we are travelling with kids. We look forward to our next trip with Isaac soon. Time to start planning for the next holiday! Before becoming a parent, I always felt that taking photos with the mobile phone was sufficient. I had a camera, but it was under utilised because I felt that it was a hassle to bring it out. Then I had a change of mind because I had a kid and realised how much I wanted to capture our moments with him whenever I can. I guess this is also because I had so little photos of myself when I was a kid, so I take as many photos as I possibly can so Isaac will have them to look back at. After starting to take photos with the camera, I hardly shoot with my mobile phone simply because the quality of the image versus that of a camera’s is just too vast. Recently, I managed to get my hands on the Canon’s EOS M6 and have been shooting with it instead of my Canon G7x. I would like to highlight that I am not a professional photographer and have never tried other cameras of similar range. Hence, all opinions below are based on my experience with the camera. The Canon EOS M6 is a 24.2 megapixel mirrorless digital camera. It has a touch screen interface and has a deep grip which allows a firm and comfortable hold. As an amateur to cameras, these are probably the main things I’d consider before deciding on a camera. This 24.2-megapixel camera produces good quality images in both JPEG and RAW format. There is minimal noise and vibrant colours, even the photos taken at its default settings look good. The touchscreen of this camera flips up to 180° and is viewed above the camera. This is ideal for people who like taking selfies. I personally think it is an important function because I use it to get my toddler to look at the camera like it is a mirror. For some unknown reason, I realised that most kids I know of seem to like looking into the mirrors. In addition, with the touch focus and touch shutter functions, the screen becomes an essential part of operating the camera. What I like most about the touchscreen, is its sensitivity. Whenever I want to change the shooting preference based on specific scenes, I will change it by selecting via the screen because it is more convenient than using the control dial. With just a tap on the screen, I can move the autofocus area. I use the autofocus function a lot because it really helps in obtaining sharper photos. The one change I made to the LCD display is its brightness. At its default brightness, the display is hardly visible when I am outdoors (which is most of the time) when it is bright. What I did was adjust the brightness to the maximum and we are good to go. The Wi-Fi function allows me to pair with my iPhone easily. All I need to do, is download Canon’s Camera Connect app and all photos/videos can be transferred to my phone instantly without the use of any computers. It is that simple and convenient. One other thing I absolutely love about this camera, is that it allows me to shoot remotely by controlling it with my phone. This is especially important for me because I have limited number of photos with my kid. Why so? The reason is because I am usually the one taking the photos. So kudos to whoever invented this remote shooting function because now i can take photos of my son and myself together all at a tap on my phone screen. The Canon EOS M6 has a number of shooting modes which is great if you are one who likes playing around with the settings when taking photos in different scenes. One of the most straightforward methods is to shoot with camera-determined settings. The camera automatically selects the optimal settings for specific scenes. All you have to do, is point and shoot. Easy peasy. If you are like me, someone who has a certain preference with the way my photos look, you will most likely use Creative Assist with this camera. This function will allow you to shoot using your favourite settings. You can adjust defocusing, image brightness, contrast, saturation and colour tone of your photos and then save the settings for all future shots when you use the Creative Assist function. You can also choose a mode matching the shooting scene if you turn the mode dial to [SCN]. When this is selected, you can choose from shooting portraits, landscapes, close-up, moving objects (great for children photography! ), evening scenes and even food. The camera will automatically configure the settings for optimal shots. The photo below is Isaac on the moving carousel. It was taken with the use of the ‘moving object’ function which will shoot continuously as the camera keeps the subject in focus. Lastly, you can also take your photos with creative filters pre-set in the camera. Of cause, they can be interactively adjusted to suit your liking. These are some of the effects which I like. On the overall, I must say it actually took me some time to adapt to this camera because I am so used to shooting in Auto mode when I use my Canon G7X. But once I got the hang of it, I started to really like it. This camera is probably most suitable for those who like exploring all the different camera controls and manually setting their own style at different shooting scenes. With the image quality and colour rendition I strongly feel that the Canon EOS M6 has delivered where it really matters. Our little one is a fan of reading. He loves his books and will tell us from time to time to read him a book before he goes to bed. Recently, he was gifted with 2 very pretty books from his god grandma and I decided to share some our favourite interactive books here. Dear Zoo by Rod Campbell. This is a lift-a-flap book that every kid has to have. It is about a child who wrote a letter to the zoo asking for a pet. The zoo then sends him different kinds of animals until they finally gave him a perfect animal to keep as a pet. Isaac learnt to remember the names of these animals in the book because we read it so many times and he is never bored of it. Until today, he anticipates what is behind the flaps even though he already knows what to expect. Definitely a good read for beginners. The Very Hungry Caterpillar by Eric Carle. This is another one of our favourites by Eric Carle (the other one has got to be ‘Brown Bear, What Do You See?’) because of the colourful illustrations. It is about a caterpillar who eats its way through a variety of food throughout the week and eventually turned into a beautiful butterfly. As we read the book with Isaac, we’d count the number of food and also talk about the days in the week. The die-cut holes are suppose to let children put their fingers through them as they count along. We got the edition which comes together with the plush, allowing Isaac to hold the caterpillar and go ‘Nom Nom Nom’ throughout the whole reading time. What’s Up? by Olivia Cosneau & Bernard Duisit. Got this as a gift from Isaac’s aunt and he loves this book because it is the first book he got that has interactive tabs which moves as he pulls the tabs. What I think are the prettiest animals in this book are the dancing flamingos and the peacock. Monkey on the Moon by Jonathan Litton, Nicola Anderson. An out of this world book about animals in outer space. Isaac will go ‘Wow’ at every flip of the page because of the very pretty pop-ups. You will find a pig in a rocket, mouse in an astronaut suit, a crocodile surfing on Saturn’s rings and animals dancing in a space ball. The way the papers are engineered in this book – Amazing! Tiger Takes Off by Jonathan Litton, Nicola Anderson. Yep, same authors as the previous book because both books were give to Isaac as a gift by his god-grandma(my godmother). In this pop-up book, you will see many animals performing in the circus. Penguins in a canon, tiger flying his plane through the loop, a fire juggling octopus and a magician rabbit pulling out carrots from a hat. This kinda sums up some of my toddler and my favourite interactive books. I must say that children these days are really fortunate. I remember when I was a kid, I only had ‘Spot the dog’ (by Eric Hill) series. Books these days are certainly much prettier and more interesting. I believe kids learn faster when they are having fun. We are careful about what he watches on the screen. I must say I am a huge fan of the YT Kids app. I can personalize my settings on the app like turning off the ‘Search’ function so it restricts the experience to a limited set of videos. The content that my kid is allowed to watch are suitable for toddlers of pre-school age. Best part of all, I can even set the timer to how long he is allowed to be watching the videos. In fact, he has learnt the words like ‘excavator’,’fire truck’ and ‘garbage truck’ from the videos. We are cool with him watching the videos as long as we are around (next to him) when he is watching them. Ooh yes, how can i even forget to mention how much he loves the Sesame Street? Many people think that by giving kids the tablets, it will eventually replace the bond between the parent and child because more time is spent on the device. To which, I think it is not entirely true. That bond is only replaced if parents neglect their kids by letting them watch videos all day long. I’d take the time to sit next to my little one when he is watching and ask him questions like “what is that in the fire truck?” and he’d tell me what he thinks. From that, I actually learn what he is thinking, or his imagination of what is in the fire truck. After that, he’d tell me he aspires to be a fireman or a police when he grows up. Communicating with him is key. Bond is not broken by the gadgets. It is broken by what people fail to do. Quite honestly, I think watching the videos with him is actually bonding time for us. I get to steal abit of ME time when he is kept occupied (of cause not all the time we’d occupy him with the ipad). I get to take a slightly longer shower, we get to eat in peace, we get to complete watching a movie. Sometimes parents just need a break. That being said, we limit the time he is on the videos and try to balance it with other activities. When he asks for the ipad, we’d encourage him to play with his toys or read books with us. He usually co-operates knowing there are other fun stuff to do other than staying home to watch videos. Going outdoors usually does the trick. In just a blink of an eye, my baby has turned 2. I find it hard to believe that he was once so tiny and could be carried with just an arm. Nowadays, when i carry him for more than an hour, i will start to feel like my arms/shoulders are breaking. When he was just a baby, we were afraid we will roll over and squash him at night (we co-sleep). Now, he does not fail to remind us every night that he is there by giving us “back massages” with his mad kickings. Regardless, I cannot express how much joy he has brought to our lives and I am thankful everyday for him. Here are some memorable moments between his 1st-2nd year. Enjoying performances by buskers and attempting to dance even before he could walk by himself. I missed his FaceTime call for the first time during a work trip and he was not too pleased. LOL! Someone was quite a climber! Extremely pampered by his papa! Even up till today, there are still many unopened toys in his room. We brought him to marina barrage and introduced him to bubbles. He could not contain his excitement! Brought him cycling for the first time thinking he’d be excited. Who would have known he decided it was too boring and insisted I carried him to sleep. I ended up carrying him in my arms and cycling at the same time. Thank God the rental was only for 2 hours! He had his taste of beer… IM KIDDING! we didn’t let him drink it even though he was insistent. First staycation at M Social and all he wanted to do was go up and down the staircase. At USS, where he found his new loves – Sesame Street. We ended up getting the annual pass and going to visit USS as frequently as we can just to watch the stage performance by sesame street. Got him a drum set and the neighbours never had any peace ever since. Soon we had so many presents that people told us we can put Oh Kimmy on top of the presents instead of the presents under the tree. The biggest presents belonged to Isaac. CNY 2017 – First day of CNY and he was down with high fever. Even so, it did not dampen his mood to get out there to meet everyone. It has been so much fun watching this little one grow up and I would never trade that for anything else in the world. If there is one thing he should know, is that he is deeply loved by many. No matter what the future brings, mummy and daddy will always have his back. Grow up well my little one. Blessed 2nd Birthday my baby! Author PrisPosted on April 1, 2017 Categories Our Parents SayTags birthday, Mister I, ParenthoodLeave a comment on Isaac is 2! Online shopping is one of the things I do during my free time. Especially after Isaac has learnt to walk, he no longer likes to be in the baby carrier / stroller all the time. I actually find myself looking out for him more than for the items on my shopping list. To me, the best part of it all is probably the avoidance of crowds or getting a parking lot. What’s more, I can shop at any time of the day. Never underestimate the power of having clean aesthetics. I have seen sites that just have items all over the place and it just makes me want to navigate away immediately because I don’t even know what to look at. Toddle.sg is able to keep their site relatively simple without compromising the interest of the audience. One of the things which drew my attention, is the use of nicely taken photographs of their products as well the the slideshow on the homepage. Despite having a ton of products they carry, browsing the products on the site is relatively simple. They are categorised according to the type of product, the brand and age/size that you are interested in. If you are working within a budget, you can also shop based on the price range. This is probably good for people like me as I have the tendency to “Add to Cart” for things that I think I “need”. It took me less than 2 minutes to sign up for an account. All that is required of me is my name, birthday and a password. Not too much information. It is as easy as that. I am spoilt for choices with Toddle.sg! They carry a wide range of products like strollers, baby carriers, educational toys, nursing & feeding products and fashion apparels. At toddle.sg, you will find popular brands like Skip Hop, BabyZen, Ergobaby, Jujube, Melissa & Doug, GAIA and more! It is extremely convenient and saves me a lot of time to get everything from just 1 site. This is as easy as the registration portion. After adding my selected items to cart, all I had to do was key in any discount code at the bottom of the page, fill in the delivery address and select payment method. Was redirected to Paypal for checkout and at the click of the button….we are done! With the use of zendesk, we can chat directly with the staff at toddle.sg should we require any assistance. Otherwise, an email will be sent to them with my enquiry. To me, it certainly beats having to make calls hands down. This is probably even more important for customers who do not reside in Singapore. Hape My Handy Workshop – yet another fantastic product I got from toddle.sg! It is something we have been looking for after we realised Isaac seems to have a liking to play pretend. He also likes knocking things with whatever he is holding. What could be a better idea than his very own handy workshop? I believe this tool set will also help to develop his hand eye coordination and his motor skills. Apart from this, I also got the Magna-tiles which I have yet to open. If there is something that you are keen on getting from toddle.sg, here’s a piece of good news for you! For spendings above SGD 100, you are entitled to 15% off if you apply the discount code – punggolbabies15. Do note that discount is not applicable for merchandises on sale, and products from BabyZen, Spectra and Boba. Discount code is valid for 2 weeks from now. Have fun toddling! [[Disclaimer]] This is a sponsored post by toddle.sg. However, views and opinions that I have shared are solely my own. 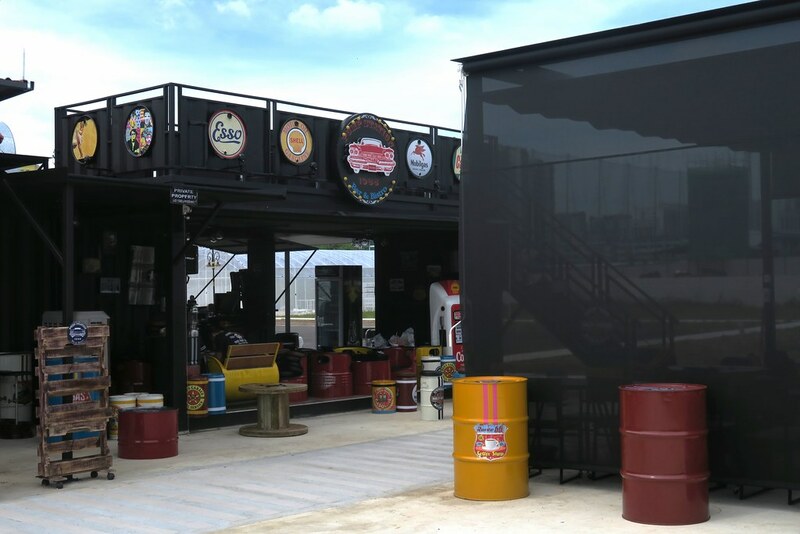 The popular and always packed Tebing Lane at Punggol is going to be even more happening with the opening of seven new eateries housed in these hip and cool containers. There’s Korean desserts, craft beer, good fish dishes, booze and even healthy desserts. 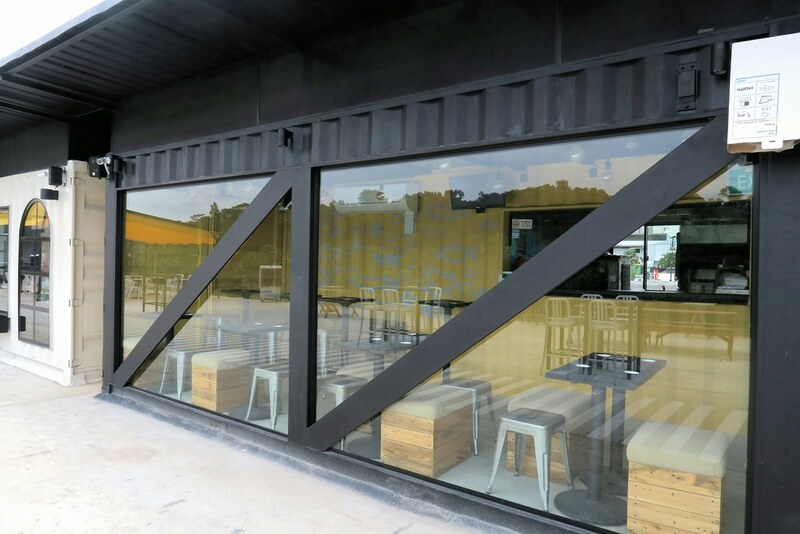 We went to take a look at these container bistros this afternoon and here’s what we saw. 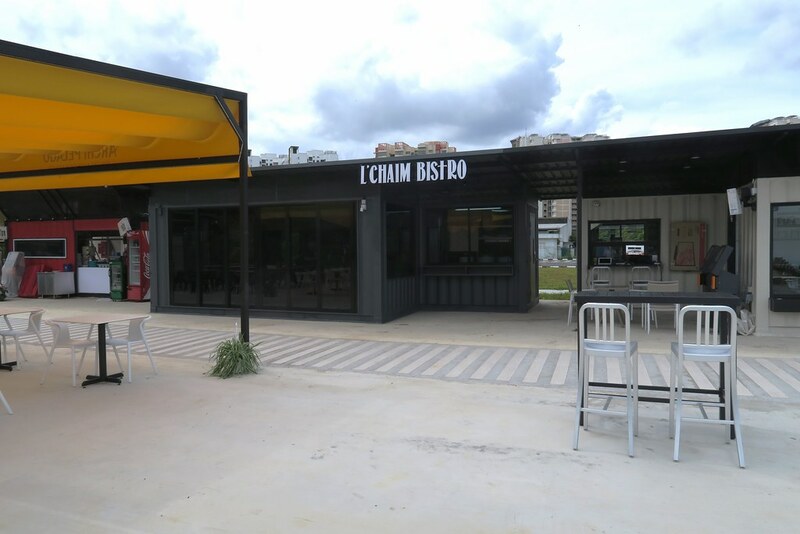 It was posted on Punggol 21 Facebook page that these will be opening tomorrow, 1 Feb, but from the looks of things, not all of the 7 bistros are ready for business. Anyone planning to check them out? 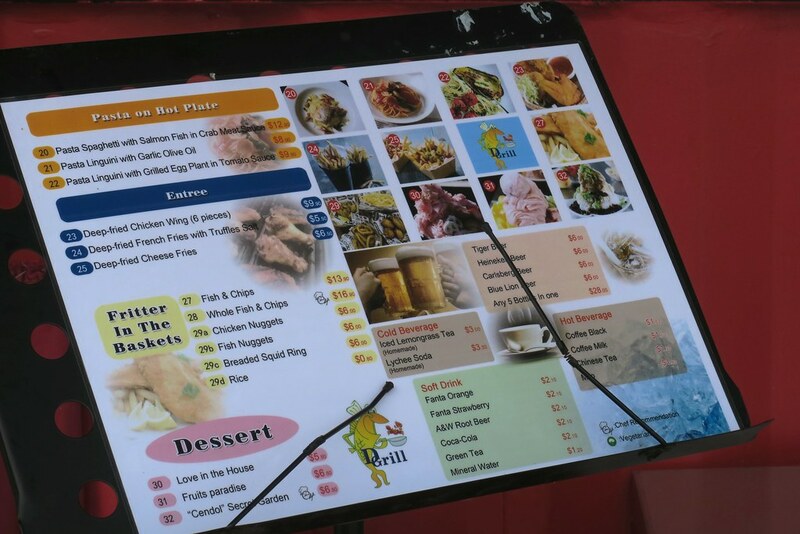 Here’s a menu we found outside DGrill. Serving pasta on hot plates, fried finger food, some desserts and drinks. Price looks reasonable. There is no indoor seating, all tables and chairs are alfresco. Huge cooler fans were spotted around the seating area outdoor. This is where you can find craft beer and probably finger food as well. Spotted a couple of tables and a bar counter with bar stools inside. 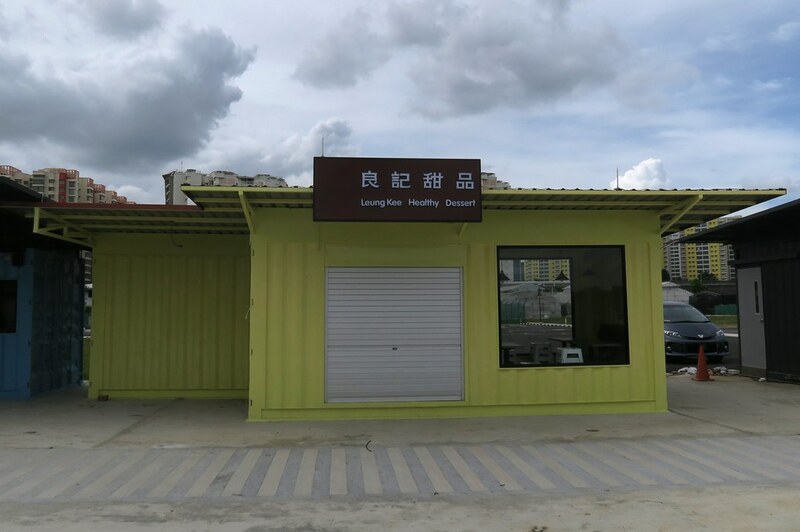 Probably can house 6 to 8 pax in the air-conditioned container. Outdoor seatings available. About seven tables available indoor and the decorations are quite cute too. Wonder if they’ll be selling Instagram-worthy and yummy bingsu. I would say the food is reasonably priced. We waited for approximately 20mins for our food but we were served free chips while waiting. Better yet, their friendly service crew went round checking if we would like the chips to be refilled. 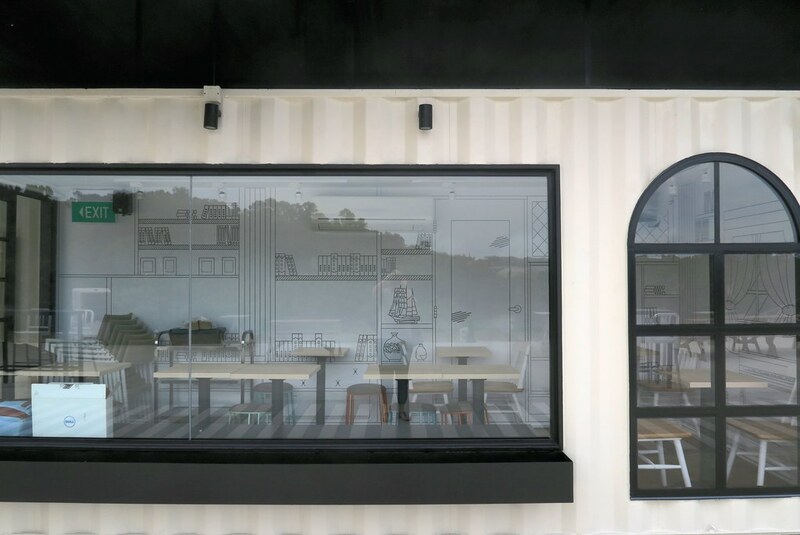 One of the most elaborated setup amongst the new container bistros at Tebing Lane. The have got 3 section with very nice tables and chairs. 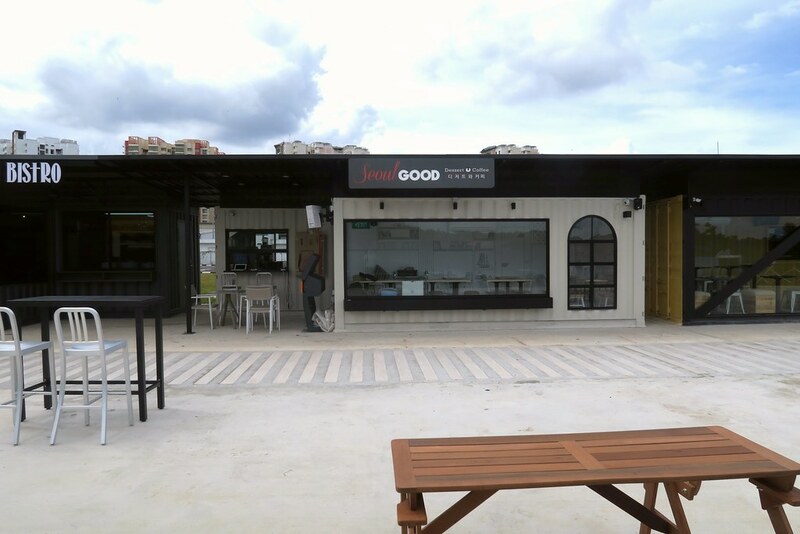 If anyone is going to tell us Punggol is so ulu, we’re so going to show these to them! 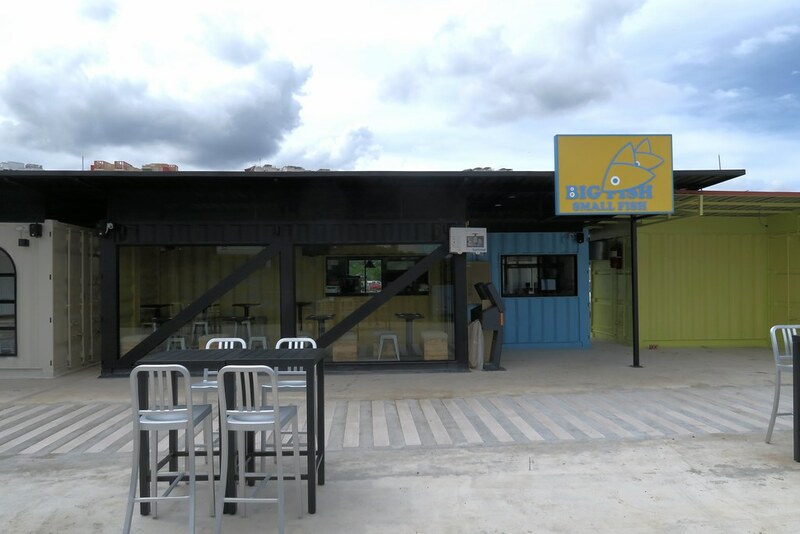 These new container bistros are located at Tebing Lane, right next to Riveria LRT. 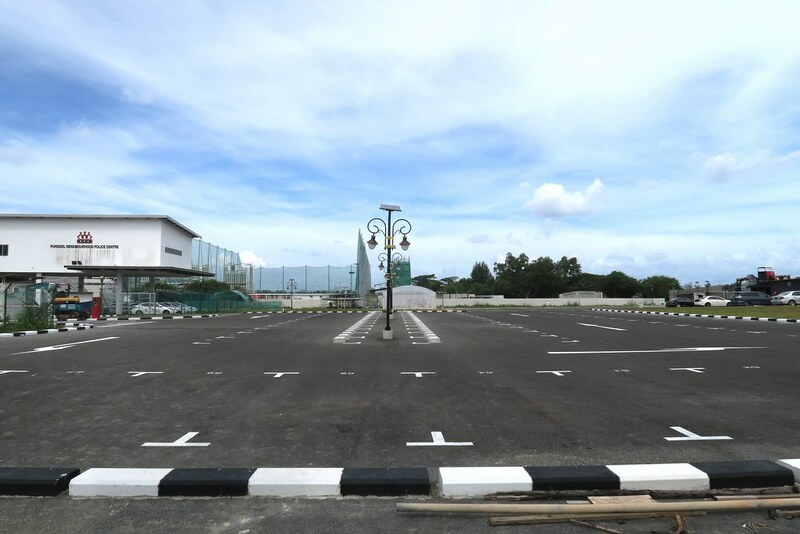 There will also be a new open-air carpark right behind these bitros for those driving. After more than a year into this whole parenting thing, I’ve grown to realise just how much I have learnt from bringing up this tiny human. As a person who is stubborn as a mule, I am surprised myself at how my perception of things are now, in a good way of cause, and how I continuously look forward to being a better individual. I did not occur to me until recently when Isaac got bitten (twice) in toddler class. I’ll get to that later. Meanwhile, here’s what I’ve learnt. “Patience is a virtue” – I used to think whoever came up with that saying must be a saint. I do not know how it is possible for anyone to wait for anything without getting annoyed, or keep their cool over the slightest frustration when they have had a bad day. All I want to do is have everyone just leave me be until I have cooled off. Of cause now that we have a toddler at home, I cannot possibly ask him to leave me alone. Even when he tests my patience further, I find myself taking a deep breaths and dealing with the situation in a very calm manner. Simply because he is only a child and I do not want to be filled with guilt after losing my temper at him. “To err is human; to forgive, divine” – As mentioned earlier, Isaac was bitten in school last week. His teacher wrote us a note to inform us what happened because she could not get us over the phone. According to her, Isaac did not want to share with another kid in class which led to the biting incident. My mister and I did not pursue the matter because we knew for a fact that children fighting/biting is inevitable in school. It only made me think what if the kid who had bitten someone else was Isaac? Would I want the other kid’s parents to scold my child? I sure as heck hope not! I must admit I was upset to see such a big bite on his chin. But we decided to teach Isaac to share the toys instead of fighting back. That same week, he was bitten again. By another kid this time. At this point, I started having doubts about telling him not to retaliate. Did I indirectly teach him not to defend himself? After all, what’s done is done. I chose to teach him to forgive. At the same time, we informed the school to watch after the kids closely because children will be children. I do not blame the kids, I am just upset that the school’s oversight allowed this to happen. “Children learn more from what you are than what you teach” – I cannot agree anymore with this quote. Especially at this age (21 months), Isaac is extremely impressionable. He is good at mimicking commercials or anything that we do. Once, he saw his daddy toss a book onto the sofa. The very next moment, he picked up the book and did exactly the same thing. Did his daddy have the right to tell him not to throw anything? Sure, but it contradicts his actions which he had just displayed. With such an impressionable toddler around us, it constantly reminds us to behave how we would like him to behave. Without a doubt, our little one is an unique individual. However, I do see some of our behaviours in him. I strongly believe that if we show him to be kind and respectful to others, he will mimic our behaviours even if he does not understand it yet. “Better bend than break” – When I was much younger and before I had my own kid, I had in mind exactly how I would raise my child. I knew for a fact I was going to be a very rigid parent. I would probably end up being the one setting all the rules, while the kid has very little power and say. But as I grew older and entered parenthood, I noticed the need to be more flexible with the way I see things. I remember how I used to think that I would not expose my son to the television programmes until he is 2 years old. But I gave in before he even turned 1. Did it stunt his growth in any way? Nope. He ended up learning to sing, dance and count while watching Elmo’s World. All that I want from being flexible, is for my child to know that he has the right to make choices and I am always willing to listen. This will also help to develop his confidence and decision making skills in future. At the end of the day, it really is his feelings and our relationship that I value the most. “A little more kindness, a little less judgement” – Every time I see any parent dealing with an upset child, I no longer judge. Simply because I do not know that mom/dad. It is certainly not the easiest job in the world being a parent. After all, a little bit of kindness / compassion goes a long way. It is really amazing how a tiny human can make such a huge impact in our lives. While in the process of teaching our little one to be a good person, I realised that we are actually teaching ourselves to be a better every time. This is undeniably the best journey in life thus far.